We're just wrapped up the 34th episode of Something From Nothing (my 5th episode as a co-host! ), and it was a lot of fun. We had special guest Jonathan Gilmour, who you may know from South Park's Dead of Winter, as well as the usual cast of myself, TC Petty III, Jason Slingerland and Chevee Dodd. Tonight's discussion hovered around big moments in gaming, building expansions off of existing framework, strategy in social gaming, text adventure games, and much more. We end with a designer Q&A lightning round, which is always fun. Check out the episode below and you can tune in live on Google / YouTube every other Sunday night at 8pm EST. It's always tough to get in a lot of comments without talking over everyone else, so here's a few extra comments that I didn't get in there. Re: Social Gaming - Jon basically said it, but I have to agree that there's a FINE LINE in social gaming (and storytelling gaming as well) where there are the right amount of rules. Too few and the players can go wild. Too many and the game becomes one note. Finding that sweet spot is something that makes a social or storytelling game stand out in the crowd. Re: Themes That Don't Work - I was thinking about this one and can't think of much. Almost everything has been done, since anything that features and action can be done in gaming. There are some things that won't sell because they are offensive or just boring, but not much that CAN'T be designed. I thought of foreclosure, since it's my day job and I can't think of something less interesting, but then again it would be an interesting commerce game and could probably work. Now my second thought might be more mechanic than theme, but a music game is really tough. Not a game about music, but a rhythm based tabletop game. Something along the lines of Guitar Hero without any electronic components would be really tough. That's everything that I couldn't squeeze in. 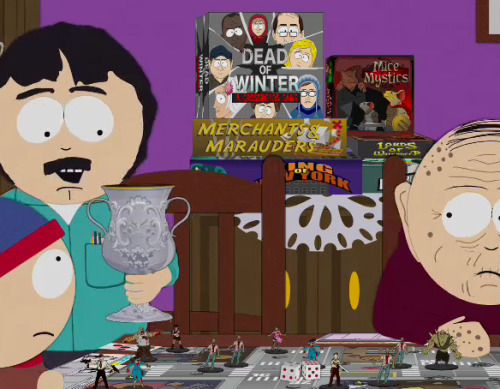 Oh, and I would have been interested on Jonathan's reaction to the South Park episode that featured Dead Of Winter (with new South Park character artwork) and I'd be curious about the community side of launching and maintaining Pocket Dungeon. Maybe next time! Thanks Jon! I’ve been a South Park fan forever now and would have died if my game ended up on there. The twitter and Facebook buzz after that episode was pretty awesome too. And I’ve just downloaded Pocket Dungeon. It seems right up my alley. Good chatting! We were shocked to see DOW on South Park! I’ve been a fan since seeing The Spirit of Christmas online when the series first started, so it was an honor to see a game I helped work on featured on the show. The community behind Pocket Dungeon has been awesome. Seeing people release their own content for it, and make it their own has been great!